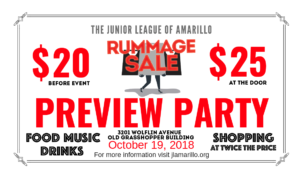 Rummage Sale is JLA’s 2nd largest fundraiser averaging $30,000 net income! Rummage Sale is a biannual event with our League membership donating the majority items for the sale. Because of our members’ support and donations, the event is very profitable making it a key fundraiser for our League! Please contact Becky Byrd (674-4585) or Ronda Jones (567-0893) with any questions. The evening includes food, beverage, adult popsicles, entertainment, and bargain shopping for a good cause. Special thanks to Jeremy Bryant for the great location. A huge thank you goes to Passion + Purpose, ANB, Et Cetera Panache, Little Brown House, Vaughan’s, Top Notch Outfitters, The Work Boot, Janey’s at 2500, Riley Blue, and Talbots for graciously donating all of their wonderful treasures to our Unique Boutique. We definitely couldn’t have done it without Sparky’s Storage Solutions donating storage space for all the fabulous items. If you are a Member click HERE for more details! !